Slime Rancher is probably one of the cutest games I've played in recent memory, I adore those little slimes. The developer has just released The Indigo Quarry Update, and it's big. 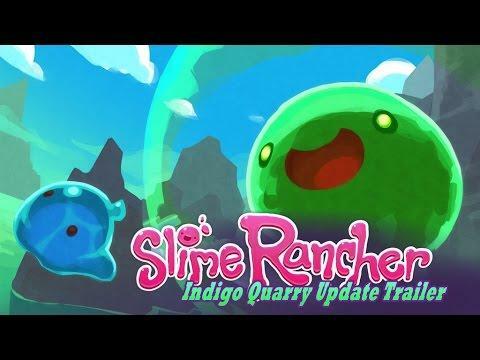 It includes a big new area, new slimes, visual improvements, a new game mode, tons of fixes and more. Quote A new, explorable zone has been added: the Indigo Quarry. The Indigo Quarry is a winding network of caves and cliffs, striated with deep purple hues from the rare minerals found within it. It was once the site of a mining project but went bust after the discovery that the rare ores it produces quickly break down in atmospheres other than that of the Far, Far Range. The quarry increases the range’s explorable space by about 50%. Future updates will expand it some and connect it to future areas in order to create a more cohesive world. That's a pretty big increase in space to explore, can't wait to take a look around. For a laugh, check out my previous article where my entire Slime collection was eaten by a bunch of gross things. This game is so cute. But im still waiting for gog. Saladien This game is so cute. +1 I'm holding out for GOG as with many other games. This has been on my wishlist for as long as I've known about it, and now you've convinced me to get it. Got it "direct" via Humble Bundle so I get DRM-free builds with my Steam key. Ye gog version and Im getting this ^^. The love in GOG is strong in here. Steam is fine to me. Yea, im hopeful that if enough Linux Users buy on gog. They will Release The Witcher 3, support more old games via wine etc. And Galaxy . I went a grabbed this as my kids love the vid.